Geneva Airport (GVA) is the closest airport to Montreux on Lac Léman in Switzerland. Travelers on flights to Zurich Airport can usually reach Montreux faster by car or train than by using connecting flights via Genève. The closest airport to Montreux is Geneva Airport (GVA) on the Swiss-French border in canton Genève. From here, fast road and rail connections are available to Montreux. Passengers arriving in Zurich Airport (ZRH) can often reach Montreux faster and cheaper by traveling from Zurich to Montreux by train or car rather than to catch a connecting flight to Geneva. Cheap flights to Geneva Airport (GVA) are available from many parts of Europe on low-cost airline EasyJet. Getting to Montreux from Geneva Airport is easy by car or train. Geneva Airport is directly next to the highway Autoroute A1, allowing for very fast transit times to Montreux. From the airport, follow the A1 to Lausanne and from here the A12 to Montreux. The total distance is 92 km and total driving time around an hour. Taxi2Airport and Suntransfers quote around €300 for a taxi or €350 a private minibus airport shuttle from Geneva Airport to Montreux. Traveling by train from Geneva Airport to Montreux is just as easy and much cheaper. Geneva Airport train station is in the basement of the airport. From here, generally four to six connections per hour are available to Montreux with traveling times generally around 1h15. Two trains an hour go directly between Montreux and Geneva Airport (GVA) – it may be worth waiting for these, especially when traveling with luggage. Other connections usually require a train change at Lausanne. Connections requiring more than one train change are hardly worth the hassle. The earliest trains from Montreux arrive at Geneva Airport around 6:30 am while the last trains for Montreux depart shortly after 11 pm. A one-way ticket from Geneva Airport to Montreux is CHF33 (CHF55 first class). Buy tickets before boarding trains! See Swiss Railways for online timetables and tickets. Zürich-Kloten Airport (ZRH), Switzerland’s largest airport, is just over 200 km from Montreux. Driving from Zurich Airport to Montreux should take just over two hours. From Zurich Airport, follow the Autobahn A1 to Bern and change here to the A12 via Fribourg to Montreux. Trains from Zurich Airport (ZRH) to Montreux take just less than three hours. Generally, two train connections per hour are available to Montreux from around 5 am to 9:30 pm. The earliest possible arrival at Zurich Airport is just after 8 am. A train change is always required – almost always in Lausanne. Some connections require a second change, usually in Biel / Bienne (or occasionally in Bern) but the overall traveling time remains close to three hours. A one-way train ticket from Zurich Airport to Montreux is CHF78 (CHF129 in first class) – Swiss Railways savings passes may be worth considering. 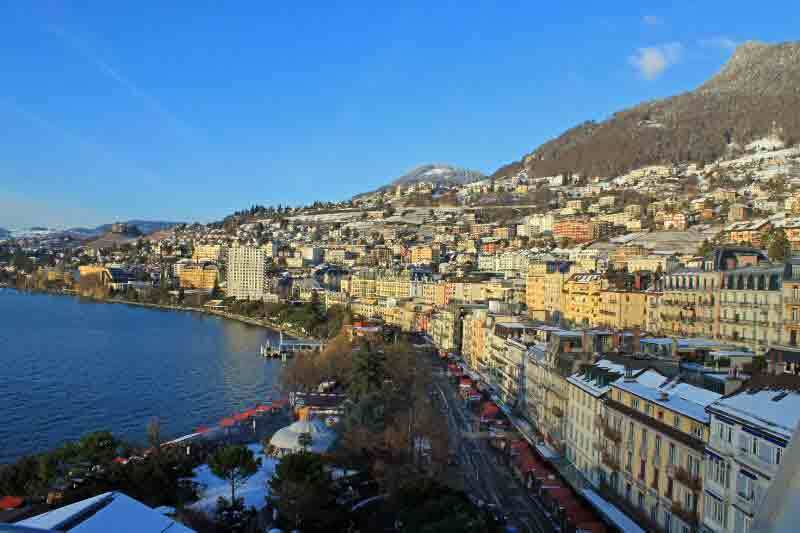 See Transportation to Montreux for more options on getting to Montreux by car, train, or boat.